Does ACA Cover Volunteer Firefighters? Q: Will the Affordable Care Act force fire departments to provide health insurance to their volunteers? A: No. 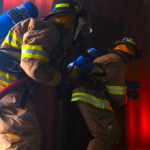 A memo issued by the Department of Treasury makes clear volunteer firefighters will not be counted as full-time employees under the Affordable Care Act.